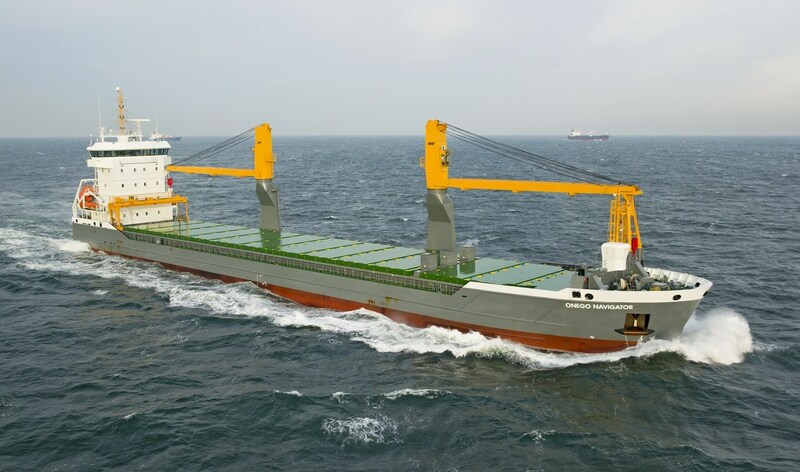 Home › Combi Freighter › Combi Freighter 8200 › Combi Freighter 8200 "Onego Navigator"
This recent newbuild by Damen Shipyards Bergum was delivered to manager Forestwave Navigation in the Netherlands on June 3, 2013. Under the charter name of ‘Onego Navigator’ the vessel was delivered in Shanghai after successful sea trials before proceeding on her maiden voyage to load in Tsingtao and Shanghai and then heading to her discharging ports in South America. This multi-purpose vessel is equipped with the latest technology to reduce fuel consumption without limiting the operational features.